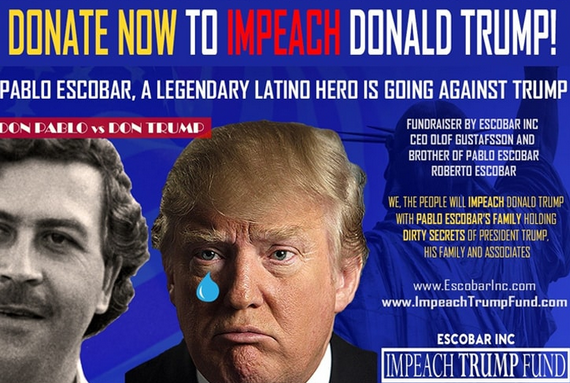 Roberto Escobar, the brother of the deceased Colombian drug kingpin, Pablo Escobar, is raising money to fund the impeachment of U.S President Donald Trump. TMZ reports that Roberto, also known as El Osito has started GoFundMe campaign to raise $50m to bolster his company's efforts to impeach Trump. According to him, the money will be used to finance “intelligence research, lobby firms and lawyers” to work towards impeaching the president. Roberto claims he has dirt on Trump and his alleged business deals with Escobar Inc., saying Special Counsel Robert Mueller would be interested. The GoFundMe page has now been taken down due to suspension that the cash may be diverted. TMZ reports that GoFundMe “has asked the fundraising page creators for additional information – including how exactly the money raised will be used.” - before the page will be restored.